Abstract: The Northwood core has a great reputation for its overclockability, even going so far as to pull back many enthusiasts from the loving clutches of AMD. 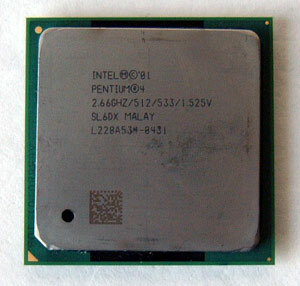 For those of us who want top of the line performance but don't want to spend a fortune, the Pentium 4 2.66 GHz processor offers a good mix of power and value. With a street price of $650 CDN ($300 US) the P4 2.66 is certainly more expensive than a comparable AMD Athlon XP, but it's still quite a bit less then the $830 CDN ($410 US) a P4 2.8 GHz commands. I highly doubt you'll notice the 140 MHz speed difference, but the $180 price difference will be immediately evident! The P4 2.66 GHz processor runs on a 133 MHz (533 MHz) FSB, uses the same familiar Socket m478 form factor and is based on the brand spanking new C1 stepping Northwood core. The 2.66 GHz processor has all the technical goodies we expect from a Pentium 4 processor including NetBurst Architecture, SSE2 and Advanced Transfer Cache. It does not support Hyper-Threading however, that speciality is reserved for 3.06GHz, and faster Pentium 4's. 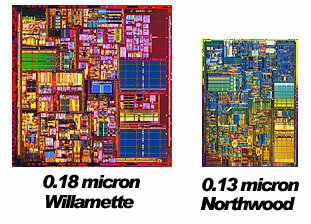 Still, the Northwood core is no slouch, with 55 million transistors in the core it is a large chunk of silicon. The chip runs on a default voltage of 1.525V (0.025V higher then B0 based Northwood's), and is based on the SL6DX revision. If you're interested in learning more about Pentium 4 technology, please read our Pentium 4 1.5 GHz and if you're interested in hearing about the Northwood P4 core, check out out P4 1.6A review. The Northwood core has a great reputation for its overclockability, even going so far as to pull back many enthusiasts from the loving clutches of AMD. Based on the C1 core, this chip was facing some pretty high hopes; beginning first with a slow and steady increase in FSB values. Armed with a new Vantec 470W power supply I was confident I wouldn't be limited by the PSU as was the case with a 300 Antec power supply and a certain 2.8GHz Pentium 4 processor. Sights were set on 145MHz, then 150MHz, and even 155 MHz FSB with no apparent problems. We did have to change the memory divider on the Albatron PX845E Pro from 3/4 to 1/1 to keep things going smoothly. At 160 MHz FSB we had to up the CPU core voltage to 1.6V to stabilize things. At 164 MHz we hit a weird wall, no matter how high the CPU Vcore (even up to 1.85V!) was turned up, the 2.66GHz chip just wouldn't take it. Perhaps we need something better then air cooling to hit those high FSB's? In the end, the chip was pushed up to a very respectable 3.26 GHz on air cooling, with a voltage of 1.65V. * - The Albatron PX845EPro enables a 3/4 memory divider by default at 133 MHz.